Passover is an important holiday in the Jewish calendar, and one that is very highly celebrated by both observant and non-observant Jews. For Jews around the world, the spring heralds the holiday of Passover or Pesach (Hebrew). Passover is the first of the three major Jewish festivals with both historical and agricultural significance (Shavuot and Sukkot). Passover is an important holiday in the Jewish calendar, and one that is very highly celebrated by both observant and non-observant Jews. Passover commemorates the freeing of the Israelites from the land of Egypt, the beginning of spring, and is named for the final of the ten plagues when God struck down the firstborn of the Egyptians and passed over the houses of the Israelites. 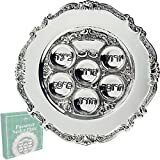 The word Pesach also is the name of the sacrificial lamb that was sacrificed at the Temple in Jerusalem at the time of this holiday in ancient times. The main event for the holiday of Passover is the festive seder meal which takes place during the evening of the first (or first and second) nights of Passover. The meal is a family ritual which follows the order of the Haggadah, and each part of the service has a specific meaning. Have you ever been to a Passover Seder? When you set the seder table there are a few important items that need to be added in addition to your silverware, napkins, and glasses. They are the seder plate, matzah, candlesticks, wine glasses, and Haggadahs (Haggadot-Hebrew plural). 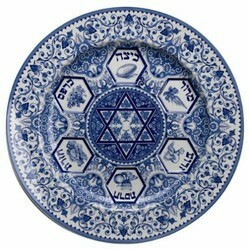 The seder plate is a ceremonial platter that has spaces for six representative items for use during the seder. The seder plate is usually marked with the name of each of the items: egg (spring), bone (sacrifice), greens (spring), parsley (spring), bitter herbs (slavery), charoset (mortar). The matzah represents the unleavened bread that the Israelites had bake quickly in their flight from Egypt. Jews do not eat any leavened bread for the duration of the Passover holiday. On the seder table, matzah is usually placed in a decorative holder called a matzah cover. Candlesticks are present for every major Jewish holiday and are lit to begin the holiday. These usually sit in the center of the seder table. The Haggadah is the guidebook for the seder which lists the order of the service, and also often has additional information and describes how to do each part of the ritual. It contains all of the readings for the entire service. The Passover seder has a particular order which is outlined in the Haggadah. All Haggadahs have the order of the seder and most have additional readings and explanations added. Some Haggadahs have beautiful artwork throughout the book as well. The seder starts with the blessing over the wine called the Kiddush. The leader says the blessing and everyone drinks their first cup of wine. Washing hands without any blessing. Dip parsley (or another similar vegetable) into salt water and eat it after a blessing. The salt water represents the tears of the slaves. One of the three matzahs on the table is broken. Part is returned to the pile, the other part is set aside. Telling the story of the Exodus from Egypt. This is the main part of the seder. Washing hands again, with a blessing in preparation for the meal. Recite two blessings over the matzah and taste the matzah for the first time that year. A blessing is recited over the bitter herbs which are then eaten usually with some matzah. The bitter herbs are combined with charoset on matzah and eaten after short reading. The main meal. This is a break in the seder and includes a full meal and dessert. The piece of matzah that was set aside is located and/or ransomed back, and eaten as the last part of the meal, a sort of dessert. This is the last thing you can eat for the night. Psalms of praise, and at the end of this section, we bless and drink the fourth and final cup of wine. The end of the Passover seder. The seder service is meant to be a joyous occasion celebrating freedom from oppression and slavery. The order of the seder delineates how and what we remind ourselves every year, and what we should tell our children about the Exodus from Egypt. At the same time, the Haggadah instructs us to praise God for the redemption, and to think of the Exodus as if we ourselves had been freed from Egypt along with our ancestors. Many traditions add other prayers for people that are currently suffering from some form of slavery and oppression so that we will not forget that oppression continues in our world. Much of the seder is sung collectively with everyone at the table participating throughout the service. The end of the seder is filled with joyous singing of traditional Passover songs. The meal that Jews eat during the Passover seder is similar to what most Americans eat on Thanksgiving. There are traditional dishes that come from every part of the world. Most Jews eat a meat meal, which includes an appetizer, salad, beef, lamb, turkey or another kosher meat, vegetable, potato, and matzah. Dessert may be fruit and a sweet, often macaroons. Passover recipes are different than recipes used during the rest of the year, because several foods may not be eaten on Passover. This list includes leavened breads of any kind, and most grains. When planning a Passover seder in your home, you will find that there are many interpretations of how to observe Passover, depending on the culture and country where someone is from. There are two main groups of Jews, Ashkenazi (European Jews) and Sephardic (Mediterranean Jews) whose traditions differ somewhat due to cultural influences. These two groups were separated during large parts of Jewish history. While the basic service remains the same, the traditional foods, and food restrictions are slightly different. There have also been additions and changes during modern times based on other Jewish oppression and current cultural phenomenon. These changes are usually related to the service itself to highlight or emphasize current events, and issues. Examples of this are Holocaust remembrances, and prayers for the Ethiopian Jews. Thus many Haggadahs have been written highlighting different parts of Jewish culture. The best way to make a Passover seder is just to have fun with it, and observe what you can, and then plan the next one from that one. Passover is a fun holiday with lots of activities that children can participate in and understand. Get your friends and family together and have a festive Passover meal. You've done a pretty thorough job of explaining the Seder here. Such a great family togetherness time!! The advantage of Passover outside Israel is you get two nights - one night for each side of the family. Here we have to alternate years. Charoset is the food that represents the mortar used for bricks during the time of the Israelite slaves in Egypt, whose freedom is celebrating during the Passover holiday. There are many versions of the Passover Haggadah that you can choose to read at your seder, and this article will point you in the direction of where to search for them.